Luxury Suites - with television sets, large runs, glass enclosure to minimize noise. 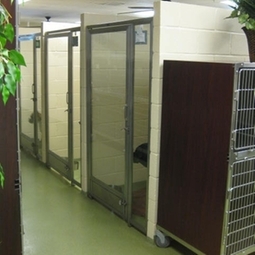 Regular Suites - Large runs where your pets are comfortable and walked 3 times per day in our private fenced yard. Cat Boarding - Our feline friends enjoy the luxury of private condos set apart from their canine pals. All with separate "potty" areas and often times a multi-suite accomodation. Also present are balconies where they and have a view of the outside world. Specialty Boarding - Our "special needs" patients can safely be boarded even if sick or very old. We place them in a special hospital boarding area where they are constantly supervised and monitored by our medical staff.